There aren’t many things that make me angry. I do get a bit worked up when a certain 3-year-old puts my shoes in the toilet. But you know what pisses me off even more? It’s when I read blogs and cookbooks that use ‘natural’ sweeteners like maple syrup, honey, dates or agave and imply that these are a better choice than regular white sugar. I know it’s tempting to fall into this trap. I’ve been there myself. But since having gestational diabetes and monitoring my blood sugar levels I’ve been forced to change my view on all sweeteners. Even using fruit to ‘sweeten’ baked goods. And like any recent convert, now whenever I see a reference to ‘natural sweeteners’, it really drives me crazy. 1. It’s just plain wrong. Even if there are slightly more minerals in honey and maple syrup and more fiber in dates, your body essentially treats natural sugars the same way… The glucose part spikes your blood sugar levels and caused all the insulin related chaos. And the fructose goes into your liver to be stored directly as fat. Yes fat. It’s a bit like low nicotine cigarettes, sure they’re slightly better but they still give you cancer. 2. It gives people a false sense of security. It’s human nature right? Oh this cake is made using healthy ‘natural’ sweeteners. That means I’m fine to have another slice. I wish I could remember where I read a study about this phenomenon. From memory researchers compared the amount of cake eaten by two groups of people. Group A were told the cake contained a certain amount of calories per slice. And group B were told it contained twice as many calories. They were then invited to eat as much cake as they liked. You know where this is heading right? The people in group A who thought the cake was healthier ate significantly more cake. More! So what sweeteners do I use? Before my gestational diabetes and subsequent diabetes diagnosis I didn’t mind using honey and maple syrup as a treat. But now that I’m watching my blood sugar, I stick to stevia. My favourite is pure stevia powder (not an affiliate link) which is expensive but a tiny amount goes a long long way. We’re talking 1/4 teaspoon to sweeten a whole cake. I also keep granular stevia like Natvia on hand for when I just need a tiny bit of sweetness like in a cup of chai or turmeric tea or these puddings below. But I limit it because it contains erythritol as well as stevia and I suspect the erythritol isn’t great for our gut microflora. I love these for so many reasons. First they’re not going to spike your blood sugar. But more importantly they only take a few minutes to stir up AND use ingredients you probably have in your pantry – perfect for those nights when you haven’t planned anything for dessert but then feel like something warm and chocolatey. The good news with this recipe is the stevia is only providing sweetness and doesn’t have any other function so you can easily substitute your preferred sweetener or even use sugar if that’s what you have. See the variations for ideas. I like them with lashings of double cream but if you’re OK with a sugar hit ice cream is also good. 1. Preheat your oven to 180C (350F) and grease two 1 cup ramekins or oven-proof tea cups. 2. 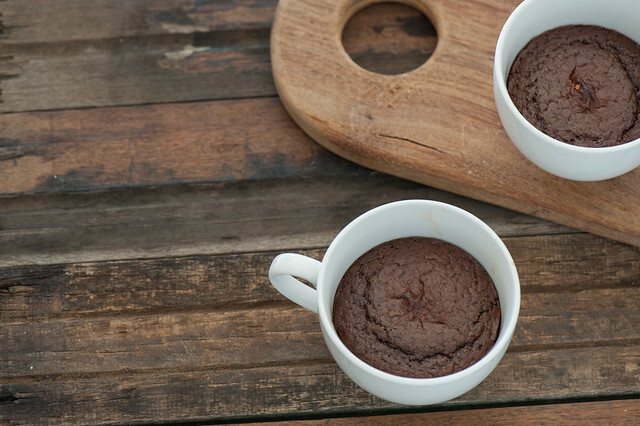 In a small bowl mix almond meal, milk, cocoa powder, stevia, egg, vanilla and baking powder until well combined. Taste and add more stevia if needed. Divide mixture between your prepared ramekins / cups. 3. Bake for 10-15 minutes or until the puddings feel springy to touch. I like them slightly underbaked so they’re squidgy in the middle. Serve warm or at room temp. no stevia – use you favourite sweetener… Honey, maple syrup or white sugar! You’ll probably need 2 tablespoons because stevia tends to be pretty instense but taste and see. dairy-free – use your favourite non-dairy milk such as almond, hemp or coconut. ginger puddings – replace the cocoa powder with 1 tablespoon grated fresh ginger. peanut butter – add a big tablespoon of peanut butter to the centre of each pud before baking. 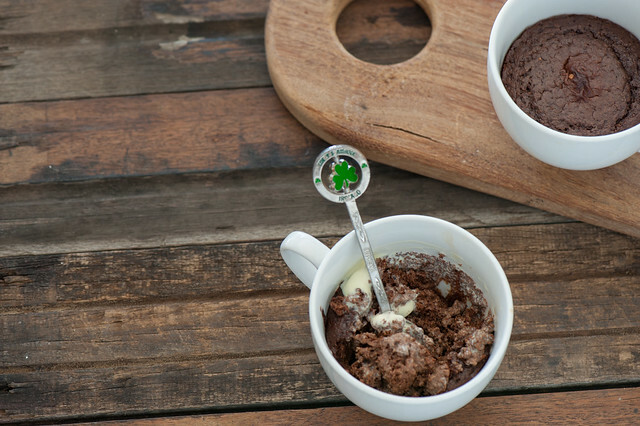 double chocolate – add a square of dark chocolate to the centre of each pud before baking. hazelnut – replace almond meal with hazelnut meal. nut-free – I haven’t tried this but replace the almond meal with 2 tablespoon flour and 2 tablespoons melted butter or coconut oil – and they won’t be low carb any more. more servings – I’ve included the weight measurements in case you have more mouths to feed! I had one of those instant mug cakes yesterday that left a foul taste in my mouth. Not only was it overly sweet and a strange consistency, I suddenly felt like I didn’t even know what I was eating. I should cut back on sugar, considering my dad’s got diabetes and I have inherited his sweet tooth. It’s just hard to deal with cravings, so a recipe like this for that late-night snack attack is very much appreciated! Oh and by the way: thank you for including the weight measurements! It always bugs me how US recipes call for a cup of this and three tablespoons of that, it seems so inaccurate! The ginger variation sounds good, I’ve got some leftover that I could use. I’m with you on the inaccuracies of the cup and spoon measurements Deirdre! Oh my gosh! Great article and I feel your pain and I’ve been diabetic since 1997. The term “sugar free” when talking about “natural sweeteners” drive me nuts because it takes advantage of people not understanding the things they eat. Except for stevia in my tea I don’t use substitutes, mostly because I’m a purist when it comes to baked goods. ? I wondered your thoughts on xylitol? I heard stevia as it tastes sweet makes the body think it is sugar and therefore reacts accordingly, so it is better to have xylitol which is a sugar but ‘better’ than the rest? I agree completely with what you are saying. However I would go farther. As a society we have been taught to love sweetened food. And like all good addicts, where a little is good, a lot is better. I’m trying to avoid all sweeteners even stevia whenever possible and while I still use sweeteners like honey or maple syrup I reduce the amount called for in the recipe by at least half or 2/3. Teaching my mouth to enjoy less sweet food is part of the changeover. The amount of sweetener of any kind asked for and used in most recipes is insane. Agree completely about ‘natural’ sweeteners! When my son was diagnosed as diabetic, I was drawn to ‘sugar-free’ cookbooks to come up with alternatives to our usual treats. Honey, maple syrup, agave syrup were all somehow ‘sugar-free’ which I would consider ill-advised at best and downright dangerous at worst. What about Rice Malt Syrup? That’s what most recipes in the “I Quit Sugar recipes” – which I discovered through your blog – use. Just curious what you think of that as a substitute? I grew a Stevia plant, dried out the leaves & made a powder. Still trying to work out how to use it though in recipes? I think it really depends. When looking at the effect of sugar, honey, stevia, dates, etc – you have to look at glycemic index and glycemic load for the effect on blood sugar. So yes, dates are essentially sugar but they are a “low” GI food, compared to sugar and white bread. It’s not just the minerals. I love dates as a treat. The last few years, I’ve done “NOvember” – no sugar, no alcohol, no wheat. I use dates as my “treat”. But anyway, it’s stevia in my coffee and tea. I was surprised to see you say that dates are low GI foods. I found one reference that listed it as being high (GI of 103), but then found this Harvard link http://www.health.harvard.edu/diseases-and-conditions/glycemic_index_and_glycemic_load_for_100_foods that shows it being surprisingly low, especially when you look at the glycemic load vs. the glycemic index. Very interesting. And of course, the only way to eat my 2-dates-as-a-treat is with a chunk of nice, sharp, cheddar. Agree with all of this, but I wouldn’t touch Stevia with a ten foot pole. It induces the same cephalic phase response as any other sweetener and your body responds accordingly. We also don’t know how a sweetener which is exponentially more potent than “real” sugars will affect us, and we may not be able to determine these effects for decades. I don’t want to be a part of that population experiment and thus would rather use “real” sugars sparingly or just not eat things that require that much sweetness to be palatable. I won’t touch stevia either!! It, just like white sugar, gives me gas and stomach cramps. I also tolerate fructose badly in general, not more than one portion of fruit a day etc, but I tolerate the occasional spoon of honey or coconut sugar <- best sugars according to my gut. I consume dried fruit in small portions (cut up in buckwheat bread) but I agree about sweetness being too dominant in the "normal" diet!let's detox. Interesting about your gut and stevia Ray… Have you tried just the stevia extract without the sugar alcohols? Like others, totally agree about sweeteners. If you want it sweet, use sugar and then you know what is going in to your body. Just reduce the amount, eat it less often and enjoy the eating. What is the point of feeling guilty when you have something deemed ‘bad’? I agree on the guilt front Sue… Thanks for raising this! Yes! I’ve been getting annoyed about this whole “it is natural and organic therefore it isn’t really sugar…” sell too. Sugar is sugar. I had GD with my first but not the subsequent two pregnancies. While I still do enjoy the now-very-odd sugary treats, I’m fanatical about having no OJ or any kind of fruit juice in the house. Great blog, keep up the good work! I use plain sugar when I bake or cook. If I want to add sweetness without any additional heat I might use honey or maple sirup for the better taste. I do not sweeten most of my meals. Then I bake I just use less sugar. My family got used to the less sweet taste and very often do not like store bought variations. I prefer to name things by its name: if something tastes sweet, there must be sugar in it. So I am aware of it! If something is very creamy, there is most likely fat involved. And so on. I am not a diabetic, but I have friends who are. If I have them over I can tell them how much sugar or carbohydrates are in a serving and they can adjust their insulin accordingly. Thanks for sharing Barbara… And if your friends are happy adjusting their insulin that’s their choice but I’d rather avoid it all together.. And this is how I choose to roll..
i tried the pure stevia in my coffee and tea and it gave me the shits .i read somewhere a connection to killing good bacteria.i prolly need to do another stint of it just to see, i didn’t have an infection and bad timing on the stevia.so i use stevia like i use garlic and onion powders in marinades.i have always been a honey man but the smart thing is to gradually use less(a strong tasting honey goes further ).develop your taste.salt and sugar are bed fellows in the kitchen and need temptation with some sour for balance . Even a tiny amount of food with Stevia in it produces the exact same response in me. I literally can’t believe how bad the effect is. On the other hand the sugar alcohols have no impact on me, but they do on others. Like mentioned above about GI – just goes to show that everybodies body and gut flora is different. And I get irritated when people act like “natural” is some miraculous thing. Know what else is natural? Opium. Khat. Cocaine. Doesn’t mean it’s healthy or a good thing. Splenda is Aspartame, not good. Thanks Susan and you raise a great point… Dessert is still dessert and it’s not a good idea to eat it all the time. PS. You are absolutely right about the fact that sugar is sugar, no matter what form you eat it in (except sugar alcohols, which I believe don’t spike your insulin, but instead do nasty things to your gut). For a nut-free version of mug pudding/cake that is still low carb, substitute ground flax seed (I use golden) for nut flour. You may want to add a bit of butter or coconut oil to make up for the lower fat content of flax compared to nuts. Decreasing the cocoa can help if you find 2Tbl overwhelming. These recipes work equally well cooked in a bowl or even a saucer; you can use it like a pancake or crepe! Cooking times may need to be adjusted slightly. Thanks Ann.. I bought some flax seeds the other day to experiment with.. Will now that to try them out! And hadn’t thought to try as a crepe.. Brilliant! Wouldn’t the flax seed make it more ‘solid’? I’m diabetic and use Spendlia. And it may not be the best, but keeps my blood sugar down and in check. In america corn syrup is widely use in almost any process food. We buy and that I think is why americans have weight issues and children in america eat too much junk food .And grow up being overweight . We raised our son and would prepare foods that were not overloaded with sugar or corn syrup, because he become over acted and had behavoirs issues when eating sweets . I enjoy reading your blog and receiving your emails and recipes . Careful with Splenda, it’s Aspartame. Amen and thanks. Where do I get “pure” stevia? And what does it look like? I bought a tin which said it was “Stevia organic 100% natural sweetener” but on the list of ingredients it said it was 99.20% Erythritol. So now I am confused. When I bake I use powdered glucose for granulated sugar and rice bran syrup instead of any liquid sugars. These are still “treats” and are infrequent but am I kidding myself? They are definitely less sweet than they would be with real sugar, and much more expensive to make- but are they really worth the effort? Should I make the real deal and serve smaller pieces? I’ve included a link to the pure stevia I buy so you can see what I’m talking about jan… You’ll probably need to order online or from a health food store. I can’t really answer whether you’re kidding yourself.. It’s a personal choice thing. If your blood sugar isn’t an issue and you don’t have a sugar / fructose addiction situation you’re probably better off just using sugar and serving smaller pieces… Especially if budget is a concern.. I am happy to see a post like this. There are SO many fads going on at any given time and people often take what they hear at face value and don’t really think about it. I look at almost any natural food as being better for you by far than foods that are more and more processed or filled with additives that you can’t even pronounce. Over the years, eggs, salt, butter, sugar, etc have been through the gambit and called unhealthy,but I always wondered about that because people had been eating them for thousands of years and butter eggs flour etc were the base ingredients in tons of recipes. Richer people used butter, cream, white flour, white sugar… It was a status thing to be able to serve these items. Eventually they became accessible to more people and we baked our hearts out… Then suddenly one day were told all of it was bad for us and given alternatives that may or may not have been better. Whenever I use natural honey in a recipe instead of white sugar, I do it for the flavour and moistness, i don’t kid myself that it is somehow healthier. Honey is so sweet, even unpastuerized 100% natural from my local beekeeper, it makes my teeth ache lol. Anything that sinful surely cant be THAT healthy ;) But there is also a big sugar beet factory near my home, where 90% of the white sugar in my region comes from and the processing is much less than you would believe. The beets are grown all around here, picked, and sent straight to the Roger’s plant. I hear things like brown sugar is healthier than white… Somehow people getting the idea that a brown colour = earthy and healthier. It’s white sugar flavoured and coloured with various darkenings of molasses. Another sweet creation that makes my teeth hurt. So i just go by Everything In Moderation. And as natural as possible but not to kid myself that even eating a ton of apples per dy is somehow healthy… Just ask my daycare kids when they eat too much fruit at snack time and end up sitting on the potty all night with nasty acidic loose BMs that smell like wine. Gross, I know. But apples are healthy right? So how does that happen?? It is too much of a good thing lol. Yes Kez… Too much of anything is problematic! Thanks for the informative info on sweeteners. I must admit that I too thought I was doing the right thing by making cakes, puddings etc with dates, honey etc. our faves are date and nut balls for a quick sweet treat. I prefer vegetarian foods and I don’t have more that 1 glass of wine week and only if out at lunch. I was stunned when the doctor told me I have mild symptoms of a fatty liver. I’m wondering if the problems were caused by the ingestion of “natural” sugar substitutes converting to fats in my liver. I use no sweeteners at all. I seem to manage quite well without. Just back in the US having left 1 year ago. Picked up some pink grapefruit juice labelled as “no added sugar” without thinking. I was looking for that nice tart hit that makes you purse your lips. But instead it tasted like melted candy. So sweet it hurt my teeth. Will completely avoid the Oceanspray brand from now on. Ingredients reveal that it is mostly concentrated apple juice. Maybe it is time for a true sweetness index or a GI index on labels. I have started using coconut sugar – how does that work in with your views? No matter what I use as a sweetener I always use less than the recipe states. Morning Jules. Re. sweeteners – I use Rice Malt Syrup. What is your opinion on this? Not a fan Pamela because it’s mostly maltose which quickly gets broken down into glucose and goes straight into your blood stream.. Causing blood sugar chaos. Plus it’s messy and I think it tastes icky.. But that’s just me. Glad to hear about your success with the pure stevia powder. I bought the same brand awhile back but had difficulty working out the measurements, so ended up with a baking disaster. (Their website said that 1/10th teaspoon equated to one cup of sugar.) Your success has encouraged me to have another go! Yes Jan you only need tiny tiny amounts of pure stevia.. The problem is sugar can play more roles than just sweetener in many baked goods so it can be tricky to substitute.. Good luck! Jules, very interesting, my wife has Type 2 Diabetes for quite a while, and it has been a struggle to keep the blood sugar low, I am not that good either, mine is hovering under 6 and sometimes over it for a few days. Regarding the “natural sweeteners”, I also had the impression that it’s ok but deep down I suspected them. I heard that they are low GI, possibly. About fruit, if having the whole fruit of course it’s better because the fibre in it helps to digest the sugar. Another thing, I like that you add variations to your recipes, it gives flexibility. Thanks. Thanks Juan glad you like the variations! When my GP wanted me to cut out sugar, she recommended using only xylitol. She used it herself for all sweetening. My GP was suspicious of stevia because of additives in it. I have used xylitol but found it far too sweet for my taste. Now I just avoid sweet things anyhow. I am looking forward to trying your recipes. I have just begun to use xylitol. I can not stand the taste of stevia. Sometimes I use rice bran syrup and sometimes rapadura. Is there any problem if they are used in moderation. Depends on what moderation is Dianne and what your insulin sensitivity is like. If you don’t like the taste of stevia it’s probably because you’ve used too much.. A little goes a long way! I’m fortunate to not have blood sugar issues and admit something like that might change some of my not-so-quiet opinions on the subject. Thanks for your option Juste. We’ll have to agree to disagree on the first point… There’s no way I’m risking high blood sugar with dates, honey or any other sugars. I´m so glad to see you are finally seeing the benefits of eating low carb! If I need a bit of sweetness, I use Truvia – which it is pretty much like Natvia (I think). Totally agree w you. When I first read about it, it sounded marvelous. But after I bought a box of packets (expensive, too, $12 for 100grams) I noticed a disclaimer. The stevia packets contain chromium and inulin, supposedly to “support a healthy glucose metabolism”. The caution on the package: Do not exceed 2 packets per day. The original article said you can have as much stevia as you want with no adverse effects. So the package I bought is “doctored” with harmful ingredients. Pays to read before you buy. I was a dummy. There is no such warning on the package of Organic stevia powder. It costs $10 per 100 grams. And no additives or disclaimers. Love your recipes. I hate to see a recipe with ingredients that fill a half page or more. Thanks for all your hard work, including the videos. Thanks Gerome! So glad you’re enjoying Stonesoup… Sorry it will be a while before I get back into the videos.. Impossible to film with a baby in the house! Jules I use Stevia as well but recently came across Luo Han Guo as a natural sweetener though I haven’t tried it and is not so easily obtainable. Have you any experience with it. I, personally, find everything containing stevia totally inedible. I tried a recipe for a cake from you, Jules, and the aftertaste of stevia was really horrible. Second time, I only used half of the amount you recommended and all I could taste was stevia, so I guess it just is not for me and I rather just eat “normal”, savoury food and have whole fruits for desert. However, couple years ago, I read an article by some researchers in the field of neurology in The New York Times and they themselves as a result of their research stopped consumption of all “sweeteners” incl. honey, stevia, etc., because it has the very same effect in the brain as sugar or maple syrup or whatever else. And 1. signals from the brain go to the whole of your body, so I guess this may outdo the non-effect of stevia to blood sugar and 2. the research is/was so very much in its infancy, that our knowledge is only basic to consider stevia consumption safe in the long term. I tried to find the article, but didn`t. Well, Supertaster, I have no idea, that option never even crossed my mind?, I should look into it. Definitely recommend some more reading by neurologists, the science has been fascinating, at least for me, lately. I always use sugar or honey as a sweeteners, as I think they both are natural. Can you please tell me that in how much quantity we have to take this? Thanks in advance. I avoid all sugar substitutes, including stevia. I find that they whet my appetite for sweet foods, which is dangerous for me as I am diabetic (currently off medication and controlling my blood sugar levels with a LCHF diet). If I want something sweet, I’ll have a small handful of raspberries or blackberries. Exactly,I find that sweets of whatever nature just make me want to eat more sweets and carbs generally. Easier to go without and spare myself those endless discussions with oneself. Yes Klara… A straight no policy can make life easier! Great article. My family made the switch to natural and organic sweeteners, with as little processing as possible, in the past year – not because we think they’re “healthier” but because we avoid processed foods. One nice upside is that a lot of natural/organic sugars (like coconut sugar, for example) don’t taste quite as sweet when using the same amount as a white sugar. On the rare say we do have a dessert (a birthday or special occasion), we can enjoy the other ingredients in the dish without being overwhelmed by the sugar. I was just wondering why it is you choose Stevia over any other form of sugar? In the link you have for it, it says that it is 450 times sweeter than sugar. Is it because you don’t have to use as much that it’s better for you? My confusion I think is in the fact that, yes, you don’t have to use as much but because it is so much sweeter doesn’t it equal out to be the same? Thanks for all your great posts! I get so many random email these days but whenever I find one of yours I read it straight away! You have so many good tips and tricks! I prefer stevia because it doesn’t contain any carbs and so doesn’t cause blood sugar spikes. It’s not actually a sugar but a unique type of chemical that is super sweet. And thank you so much for your kind words about my emails… You’ve made my day! Thank you for all the good work. As a conscientious chef and baker, I try using the best alternative to white sugar or high fructose corn syrup. There has to be a rewrite of how baked goods are sweetened for the masses if the gallon of expensive maple syrup I just purchased is not any better than sugar. Hi Jules, thanks for this recipe; I baked it today for a lunch treat for my kids, doubling the quantities and putting them in cupcake cases. Turned out great! (And was SO quick to throw together.) They prompted a question about cocoa powder, though – is there a significant difference amongst these too? We used a ‘fancy’ cocoa powder from the health shop, and the flavour was intensely chocolatey. Do you think there’s a big difference between brands? Huge difference between brands and whether the cocoa powder has been alkalised or not. I use a raw caocoa powder because I like the flavour best but the colour isn’t as dark as alkalised (Dutch process) powder. I have seen so many recepies saing ‘no sugar’, when containing agave, honny, mapel, or even brown sugar. I know Jenny! It’s just plain wrong! Recently while reading Primal Mind Primal body I learnt that the researchers who created aspartame & saccharine discovered their usabilty as sweetners when, while doing research that had nothing to do with food or sweetners, they decided to taste the chemicals and liked the sweet taste. The researches who developed sucralose – Splenda, originally started out in an attempt to create insecticide. Any chemical subsitutes for sugar should be avoided. Beware of anything that has high fructose corn syrup found in lots of processed foods. This book recommends only pure Stevia. It also says that Agave as it contains from 70% – 97% pure fructose.